Jack Meades pub and restaurant has got to be one of the more remarkable and intriguing 18th Century agricultural sites in the country. As a young man I hadn't much time for the older men who drank there, preferring to spend my time having the craic and the beer with my own generation. But at my present age, and with my interest in our local heritage, I often rue the opportunities I would have had to ask the older people about the buildings that litter the area, all within a stones throw of the pub. The pub itself is fascinating, dating as it has since 1705. I've written about its landlords and the lineage of the present owners before. You've got to have respect for those who have managed to sustain and transform a business in the countryside when so much has changed in our attitudes as a country to drinking and driving. Part of that business is to protect and allow access to a varied amount of heritage related buildings which we went along to see on our most recent free bank holiday Monday rambles. 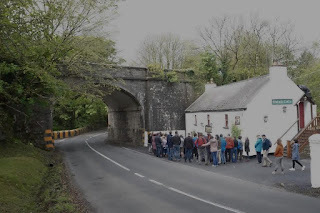 The pub of course is synonymous with its location beside the old Railway bridge of the Malcomsons, in their attempt to run a rail line between the city and Passage East. 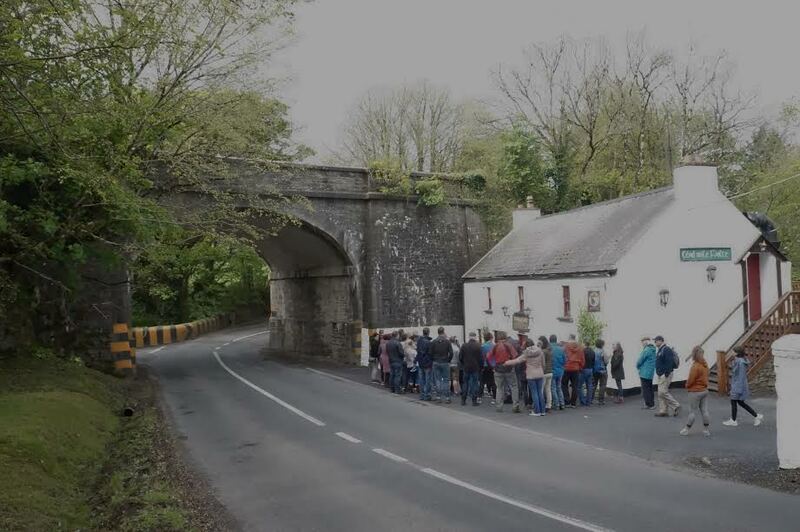 It earns the pub the distinction of Ireland's only fly over bridge. 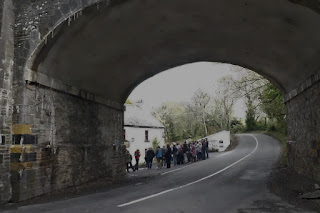 But of course it has a number of bridges on the site, as at least one, and perhaps two others allow the Ballycanvan stream to flow under the Cheekpoint Road that itself passes under the main structure. Across the road we stood beside the old Delehunty corn mill and discussed its amazing design features including an overshot wheel within the building and the man made leat that runs from Brook Lodge, from where the water to run the mill was released via a man made pond. It was wonderful to have a relation of the Delehuntys that ran the mill all those years ago present, but sad too as he reminded us of the tragedy at the pond when his relation and two young companions drowned while swimming there. I need to tie my hands to my body I'm afraid! At least I wasn't waving a stick this time. 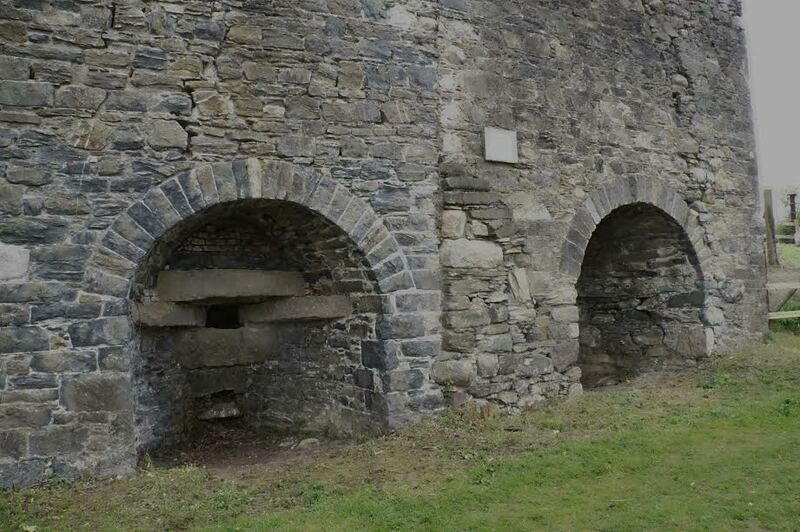 The Ice House of course is an impressive structure, which I have also discussed before. We looked at its design, the supply of ice and the likely purpose it was put to. Then it was along to the Lime Kilns down the Pill, and a discussion about the process of lime burning, how the lime stone was brought and the likely uses of the finished product. I got a surprised reaction from many when I related how the lime was used to treat the waste from a dry toilet, something I had seen myself at my grans in the 1980's. Just as well Carmel, a relation from England, didn't mention to all but myself and a few within earshot of how it was used over corpses, particularly in times of plague. 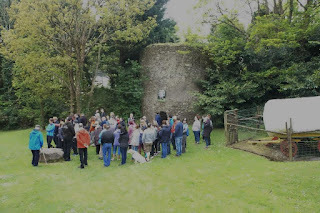 We then discussed the old salt water mill that resides on private lands down towards the mouth of the Pill, and how in the past, in a way similar to the monks at Dunbrody, the incoming tide was retained behind sluice gates only to be released when the tide below the mill was lower and gravity allowed the mill wheel to be turned by the water returning to its source. We rambled up to look back on Ballymaclode Castle and discuss her twin tower at Ballycanvan that later became a fine Georgian mansion of the same name. And returning to the pub we passed off Redmonds forge where in the past not along horses were shod, but implements of farm works and fishermen were repaired or made. 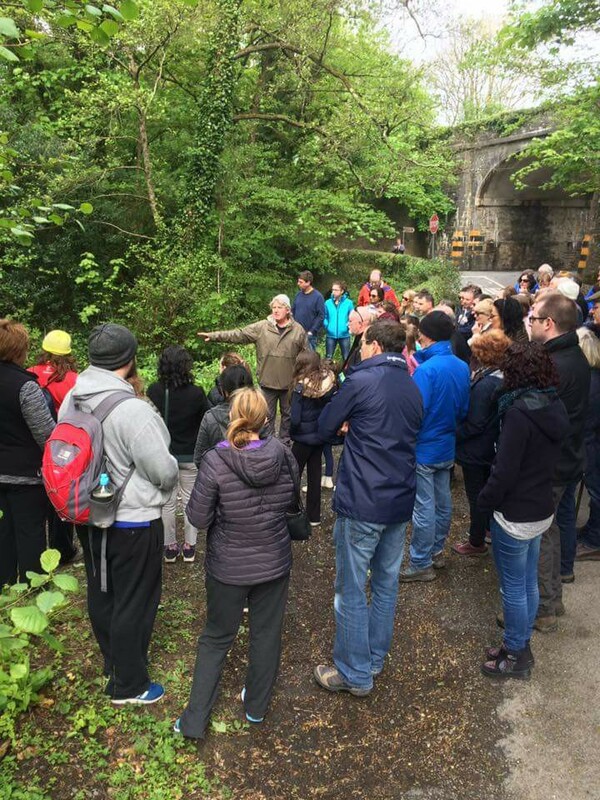 Our next event will be the June Bank Holiday Monday, commencing at 11am at Faithlegg House Hotel and will look at the history surrounding the Faithlegg estate. I'm only hoping the spirit and enthusiasm of those who came yesterday is repeated. Delighted to see familiar faces, and great to meet many new ones too. Young and old seemed to enjoy it, and the questions and the comments were all helpful in my own learning. A young lad from sixth class in Faithlegg was at my side through the walk, and he has an obvious eye for his local heritage. For Facebook users we have an event page here which we will use to keep people updated on the Faithlegg heritage ramble .